Fans of 3D platformers have never had it better. While we all yearn for the days of yore where a console couldn’t be a major player without a mascot that could hop ‘n bop, there’s no denying that for every all-time classic like Super Mario 64 and Crash Bandicoot, you had a bargain bin disaster like Rascal or Bubsy 3D. Today, games like A Hat in Time, Super Mario Odyssey, and Yooka-Laylee are bringing back that nostalgic fun with none of the baggage and all of the enhancements modern technology can provide to great effect. Ginger: Beyond the Crystal is the latest to keep the wave of 90’s platforming love going – but does it reach those same highs, or simply serve as a reminder of why the genre died in the first place? The game’s story initially seems promising, as a well illustrated storybook-style intro sets up the plot complete with voiced narration. As the uninspired “chosen one” tale drones on, however, you’ll quickly feel the desire to skip past it entirely. Put simply, something has gone horribly wrong in the world of Ginger, and our titular blue hero is the only guy who can put a stop to it. The game clearly stops caring around the point where the bland and lifeless characters start talking in mumbles and grunts instead of full voice acting like in the opening, so I stopped paying attention to the narrative as well. The game can be divided into three types of platforming: free-roaming, 2.5D, and 3D. The free-roaming takes place solely in the hub worlds and is more city builder than platformer to be honest, as in these sections you run around chatting up NPCs to perform fetch quests that reward you with materials to rebuild the destroyed towns. Like all fetch quests, these missions are extremely boring, and fixing up broken buildings with the materials you get doesn’t feel particularly rewarding. In contrast, the 3D levels are easily the most fun parts of the game as they feel heavily reminiscent of the challenge stages in Super Mario Sunshine where Mario loses FLUDD and has to navigate precarious moving platforms floating above a bottomless pit, only the level layouts in Ginger are a bit more basic and much shorter. This leaves the 2.5D levels as the meat of the game, and while they don’t hit the lows of the free roaming bits, they’re not really fun like the 3D sections either. Most of the time you’re moving from left to right or vice versa, occasionally moving into or out of the screen. Ginger’s moveset is very limited and consists of a standard punch, a dash punch that will almost always get you hurt if used for anything but getting around quicker, and a double jump. Because of this, you’re rarely going to find yourself doing anything that you couldn’t do in any other generic platformer. Jump here, bash an enemy there, rinse and repeat. The only gimmick separating Ginger from the rest of the pack is his ability to switch costumes to gain new abilities, which are used to reach hidden areas or get special items. For example, donning a mouse costume will let Ginger shrink, while a bard costume lets him play music to create new platforms. These powers can only be used in very specific spots however, which kind of defeats the purpose of having the mechanic at all. Levels will even try to add variety with tasks like collecting honey in a timed sequence or exploring a cavern to find cheese for a miner mouse, but these fail to shake up the pedestrian platforming in any meaningful way. There are also just some really obnoxious design decisions. Ginger lacks a “blob shadow”, which you may better know as that dark circle that appears under your character when jumping in most 3D platformers. Sure, it looks unrealistic, but it’s there so you can quickly gauge where you are in 3D space to make jumps easier. Because of this feature’s absence, the rare points where the game’s platforming decides to challenge you can be quite annoying. Perhaps my least favorite mechanic was the need to mash the right analog stick up and down to move vehicles found in various stages like minecarts and a small zeppelin. Not only does it make no sense as a control method, it barely functions and grinds the pacing to a halt. Graphically, the game looks like a slightly enhanced mobile game in terms of both models and UI, which doesn’t give it a great look but is understandable for a small indie title. The music however, is very clearly trying to rip-off the style of Banjo-Kazooie composer Grant Kirkhope, and it just doesn’t work at all. The criticism doesn’t end there, as Ginger’s framerate is incredibly poor. I’m not saying every game has to reach 60 FPS to be worthwhile, but when you can’t even maintain a steady 30 FPS in a game as basic as this, something has gone horribly wrong. The load times are similarly atrocious – not quite Sonic 06 levels of bad, but the fact that the comparison crossed my mind says it all. 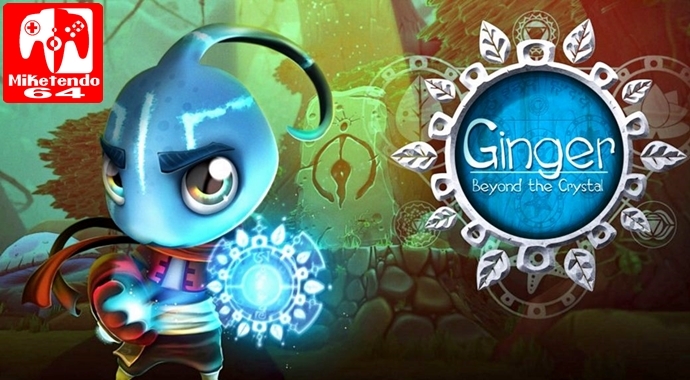 In a world where 3D platformers are finally seeing a resurgence, there’s little reason to waste your time with a game as unambitious and dull as Ginger: Beyond the Crystal. If you just finished up Odyssey and find yourself desperate for more hopping and bopping then maybe give this a look, but I’d honestly just recommend waiting for Yooka-Laylee to finally come out on Switch.